In a statement issued on Friday evening, Ms Yates said: "Our beautiful little boy has gone, we are so proud of you Charlie." Prime Minister Theresa May said: "I am deeply saddened by the death of Charlie Gard. My thoughts and prayers are with Charlie's parents Chris and Connie at this difficult time." Pope Francis tweeted: "I entrust little Charlie to the Father and pray for his parents and all those who loved him." GOSH said it sent its "heartfelt condolences" to Charlie's parents and loved ones. US Vice-President Mike Pence tweeted: "Saddened to hear of the passing of Charlie Gard. Karen & I offer our prayers & condolences to his loving parents during this difficult time." On Thursday, Ms Yates said the couple had been denied their "final wish" to have more time with him after a High Court judge ruled that he would be moved to a hospice and have his life support withdrawn soon after. 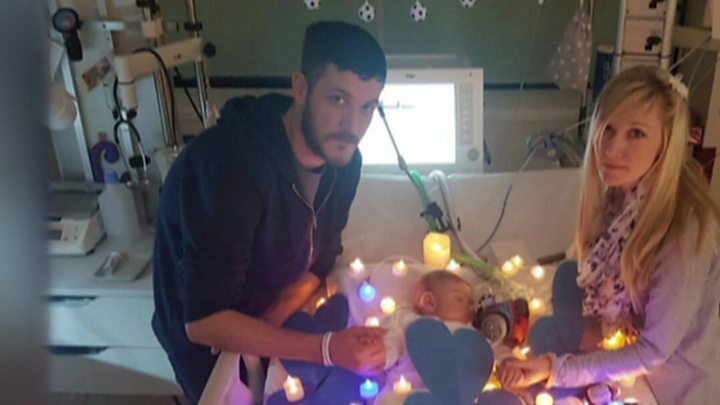 Hundreds of people - called Charlie's Army - lent their support to his parents, who raised £1.35m to take him to the US for treatment. Charlie's plight attracted the attention of Pope Francis and US president Donald Trump. In a statement released earlier this month, the Vatican said: "For them he prays, hoping that their desire to accompany and care for their own child to the end is not ignored." After his tweet, Prof Hirano co-signed a letter with other medical experts which suggested unpublished data showed therapy could improve Charlie's brain condition. Image caption HIs parents have described him as an "absolute warrior"
Paying tribute to their son following the end of their legal challenge the couple, both in their 30s and of Bedfont, west London, had described him as an "absolute warrior". On Monday Mr Gard said: "Mummy and Daddy love you so much Charlie, we always have and we always will and we are so sorry that we couldn't save you. 21 July: Lawyer representing Great Ormond Street says Charlie's new scan makes for "sad reading"